Magura suspension forks include the Odur, Menja, Durin, Thor and Wotan models. At the top of the range is the award winning Magura Wotan Fork with remote flight control for all mountain, enduro and freeride use. Air spring fork, Double Arch Design for maximum stiffness, thru axle system, Postmount 8" disc mounts, adjustable platform compression damping, adjustable rebound, preload via air valve, for disc brakes up to: 210mm. Magura Odur Fork for All Mountain, Tour, Cross Country: versatile coil spring fork featuring Double Arch Design. Cold forged fork crown made of aluminium 6082 T6, integrated cable stops for the remote control, oil damping with DLO, 100 or 85mm travel, dynamic lockout, rebound, for disc brakes up to: 210mm. Magura Menja Fork for All Mountain, Tour, X-Country: Air sprung, 130, 100 and 85 travel, preload via air valve, for disc brakes up to: 210mm, dynamic lockout, rebound. 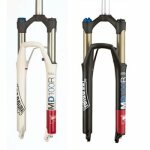 Magura Durin Race fork for Cross Country and Tour: totally new designed XC super lightweight race air spring fork featuring: Oil damped with DLO, air sprung, Travel (in mm): 100mm, 80mm, Dynamic Lockout via RCL remote control, for disc brakes up to: 210mm. The Magura Thor fork is a completely new design, lightweight and uncompromising All Mountain fork, travel from 140 mm - 100 mm with RCL remote control. Postmount 7" disc mounts, direct mount of the caliper in combination with a 180 mm/7" rotor. Oil damping, air sprung, for disc brakes up to: 210mm.